You can rely on Free People to be young, cool and current when it comes to clothing and accessories, as this is the aesthetic on which the brand has built its business. The label is aimed at women in their 20s and is consistently exciting and fashion-forward with a broad range of lines catering to everything from the need for a winter coat to new summer shoes. 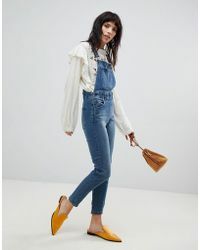 The jumpsuits line from Free People is diverse, including a tuxedo one-piece style, utility jumpsuits, jumpsuits and overalls. There are lingerie style all in ones, leotards and playsuits too in a wide selection of fabrics and styles, from velvet through to checks and cashmere.